A few days ago my family made our annual trek to Canyon Lake in the Hill Country of South Central Texas. It is a tradition began by my son and his wife and our grandchildren a few years ago when the allure of Schlitterbahn, a water park in New Braunfels, Texas, became too great. Once the joys of paying exorbitant prices to splash in water with thousands of other people under a blazing sun became apparent, it quickly became an annual affair. The fact that there were Canyon Lake, a scenic man-made water paradise nearby with boating, the Guadalupe River with tubing and rafting, and shopping with scads of antique, junk, and outlet stores around added to the charm of the area. Not to mention that nearby was one of the premier barbeque restaurants of Texas, so there was the opportunity to enjoy quisine magnifique, also. In time, they set aside a week of each year to bask in the local culture and in general have a good time relaxing. Since our family, thankfully, gets along pretty well, we oldsters were invited to tag along, and for the last three to four years we have done just that, usually not staying the entire week, but getting in three or four days of fun and visitation. Son and family stay in a high-fallutin’ upscale time share condo while we poor senior citizens fend for ourselves, usually locating a nearby motel to be within driving distance of our kids. It’s a nice arrangement and very enjoyable. In the past, we’ve been able to hop into a single vehicle and head for our destination of the day, and we often share breakfasts, lunches, and dinners as the opportunity arises. The normal weekly schedule calls for a couple of days at Schlitterbahn, one day renting a boat on the lake, one day shopping, at least one evening at Salt Lick Barbeque, one day of wandering around the area, and a day or two of…well… nothing. Sometimes you need to rest up from having so much fun. This of course is the schedule for the week, but since Shirley and I don’t spend the full week there, we sort of jump in where ever the schedule is at during the week and tag along. In the vernacular of the contemporary, it’s a very bonding experience for the family…plus it’s just plain fun. My only problem is the Schlitterbahn ordeal. It seems that the older I get I am becoming more…..well…anti-social. It’s not that I’m really anti-social; I just don’t care to be around hoards of people. And hoards of humanity are what you get at places like Schlitterbahn. To top it off, at Schlitterbahn, people are not really at their best, appearance-wise…and sometimes behavior-wise. I have gone there a few times with the family, and I used to be concerned about how I looked. It pains me to say this, but I’m getting a little older now (cough) and don’t really have a buffed physique like I would like to have when I stroll around in a swimsuit (with a teeshirt). But after visiting Schlitterbahn a few times, I can walk into the park with my head held high without any concern of some little kid telling his mama, “Hey, Ma! Look at the funny-looking man!” Believe me, it is a fact that no matter how bad you think you look, you will find at least ten people in the park who make you look like a health fitness freak…and they seemingly are proud of how they look! So anyway, this essay is not intended to knock Schlitterbahn. I actually sort of enjoyed my visits there. It’s just that my interests tend to drift to the more quiet and restful…like fishing. I am not a lake fisherman, I prefer rivers and streams. More specifically, I prefer fishing in cold, fresh water rivers and streams for rainbow and brown trout. I have caught catfish, walleye, perch, panfish, drum, redfish, snapper, gar, even shark, you name it, and to me they’re all about as exciting as catching a log. I was able to do my share of trout fishing when we lived in Wyoming, but naturally here along the Gulf Coast of Texas, fresh water trout are a little scarce. 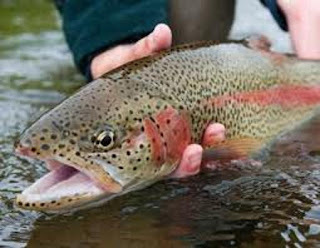 Amazingly, here in the Houston area the officials are dumping trout in some of the local small lakes during the winter season when the water is cold enough and allowing fishermen to go after them for the two or three weeks that they are available. On the days of the trout planting, the lakes are lined shoulder to shoulder with wannabe fishermen. Snared lines and frayed tempers are the standard for the day. It ain’t really fishing. I have fished for speckled trout in Galveston Bay, and they’re a lot of fun to catch, but a fisherman needs a boat and a certain amount of mobility to track them down. Up until now, the closest place I had found to Wyoming fishing was, believe it or not, Branson, Missouri. There, amongst the glitter of gaudy country shows, rests Table Rock Lake, a large man-made lake formed with the building of Table Rock Dam back in the fifties. Being a lake, it doesn’t really interest me, fishing-wise, but below Table Rock Dam, it’s another story. The water that flows from Table Rock Dam comes from the bottom of the lake, probably at a depth of 100-150 feet, and is very cold, in the mid fifty degree range…perfect for rainbow and brown trout. The water stays cold for 10-12 miles downstream before eventually warming up to a non-trout-habitable temperature. There is a trout hatchery at the base of the dam which keeps the river well stocked with trout. The “river” is actually called Lake Taneycomo for the twelve mile stretch below the dam, but it’s really just a nice sized river. Out of Lake Taneycomo I have caught some beautiful trout using the same fishing gear I used in Wyoming. Whi ch brings us back to Canyon Lake. Although we had visited Canyon Lake several times in the past, I did not discover until the last day of our visit last year that the situation with the Guadalupe River below the Canyon Lake Dam is quite similar to the Branson, Missouri scenario…big lake, big dam, cold water, and trout. When I discovered last year that the Guadalupe was stocked with trout on a somewhat regular basis, I determined that this year when we visited I would be loaded for bear…er, fish. I had walked down to the water outlet below the dam last year to inspect the river and found a beautiful, cold, clear river that beckoned promisingly to the aspiring fisherman. Surrounded by heavily wooded gentle hills, the picturesque scene beat anything I had observed at Schlitterbahn. So I set my plans afoot for this year. The day that the family set sail for Schlitterbahn, I waved goodby, wished them fun, and grabbed my fishing gear. My fly fishing hardware consists of a Shakespeare Silent TruArt Automatic Reel Model FC1836. It is approximately fifty years old. My dad bought two reels for himself and me around 1960. I don’t know what happened to his, but mine has been used extensively, and, other than an occasional cleaning, it has never been serviced or broken. There’s not a piece of plastic on it anywhere…all metal and beautifully crafted. I have used several rods over the years and am now using an Eagle Claw IM7 GrangerFly X6 high module graphite 9’ 0” fly rod. It’s a little long, but I like the flexibility. I use a forward-weighted floating line with a six foot, eight pound test leader. Packing along my muddler minnows, wooly worms, wooly buggers (for the uninitiated, these are types of artificial flies), and even a couple of old Platte River Specials, I parked my car and walked down the 58 steps from the parking area to the water’s edge. The sun was high in the sky and the heat of the day was already setting in (I didn’t say I was an EARLY MORNING fisherman.) There was a slight breeze rustling through the trees wherein the scissortails, swallows, and mockingbirds were making themselves known. The water was flowing from my right to left into a deep pool about 20 yards down river. The pool was bordered by shallows on the other side and to the left over which the water rippled and the rocks underneath glistened in the sunlight. Tying on a size 8 silver muddler minnow, I pulled out a few yards of line and began to work the fly around the edges of the pool. After each float of the fly I gently brought the line up and behind me for a couple of turns to dry the fly and then settle the fly back onto the water’s surface, hopefully imitating an insect resting on the water. I repeated this action several times, working up, down, and around the pool, but without much luck. I noticed about 100 yards downriver from me was another fly fisherman plying his trade. Since fishermen are notorious kibitzers and copycats, I watched him out of the corner of my eye to see if he had any secret tricks, but his luck was running the same as mine. I decided to change weapons. I tied on a size 8 gold wooly bugger and laid it out there for my unseen trophy to latch onto. For twenty minutes there was only the sound of the swishing line and the rippling water as I worked the line every way I could think of. A couple of times, as I laid the fly onto the water’s surface, I thought I glimpsed a flash of movement or an abnormal ripple on the nearby water, but there was no corresponding singing of the reel as the line played out. At this time I must confess another of my fishing weaknesses (besides no early mornings) that keeps me from being a great fisherman…I am not a patient fisherman. Let me catch a fish about every hour, and I’ll fish all day. Let me go two hours without a fish, and I’m ready to pack it in. By this time, I was getting close to my cut-off point. I decided to try a size 8 black with red tail wooly worm. Those little dudes are usually pretty successful, and I decided to give it this one last best shot before going home. Flipping the line into a figure eight pattern to avoid an overhanging branch, I laid the wooly worm at the upstream edge of the deep pool and let it meander into the depth. I saw the upheaval of water just as my line straightened like an arrow. There was a glimpse of red and gold, and the taunt line began to slice through the water like a knife through butter. I fought to keep the loose line floating at my feet straight as I attempted at the same time to activate the auto return on my reel. Holding the line with my left hand, I strained to maintain a proper tension on the fragile connection between the fish and me. Too little and the trout would spit out the fly like a seed and too much tension could cause the line to snap. Unable to shake the object in his mouth by just violent swimming, the trout broke the surface and began to take wild jumps in the air, all the while shaking its head wildly. I saw then that I had snagged a huge rainbow trout. Probably 5 to 7 pounds, it flashed its array of colors every time it writhed from left to right in an effort to shake the hook. With its mouth opening and closing wildly, it would crash back into the water and race madly for another part of the pool, then shoot straight up vertically to try again to dislodge its captor. Incredibly, out of the corner of my eye, I saw the downstream fly fisherman standing motionless as he observed my struggles. Suddenly the rainbow headed straight toward me, thus slackening the line. I worked feverishly to take in the line to maintain tension, and a second later worked just as feverishly to let out line as he made an abrupt U-turn and headed away from me. But I began to feel a lessening of the violent resistance. The big trout was beginning to tire. Each pull and each jump was less intense than the previous. After another strong swim away from me and a last cutting of the line through the water, his resistance was minimal, and I was able to carefully and slowly ease him up near my feet. I reached down and gently slipped my fingers into his mouth and gill and lifted him up. He was the most beautiful rainbow trout I had ever seen. Massive in size with the trademark rainbow colors down the side. He was called in these parts a “holdover”…one of the fingerlings planted in the river several years earlier which had somehow survived countless fishing days and hungry predators. In the left side of his mouth I saw the remains of a small rusty hook, a souvenir of a past battle. Though tired from the struggle, he gasped for water, and strangely, he appeared to look at me. His eye seem to communicate a resignation that he had lost the conflict against a worthy adversary, and he was ready to meet his fate. There would be no more battles. As I held him in from of me, I saw him for what he was…a survivor in a world of endless struggle, who had given his all and was now resigned to his judgment. Using a small pair of needle nose pliers, I gently remove my fly, and then reached to the other side of his mouth and removed the remains of the old hook. Holding my hand under his belly, I eased the big trout back into the water and gave him a few back and forth pushes to get water moving into his gills again. He moved slowly, tiredly, but then he deliberately moved away about six feet and circled around back toward me. For an instant he stopped, facing me, as if to say, “Thanks, Friend!” and then, with renewed strength, he turned quickly to the left and disappeared in a stream of bubbles. I gathered up my gear and walked to my car. I’m not sure if I’ll ever fish again.